December 23: Fourth Sunday of Advent - A Service for Strength & Healing at Christmas at 10:30 a.m.
As the day of Christmas draws near, some of us may feel the grief over loved ones no longer present. Others of us may feel stressed by the busyness and pressures of the season, and still others of us may feel the strain of relationships or other burdens we may carry at this time of the year. 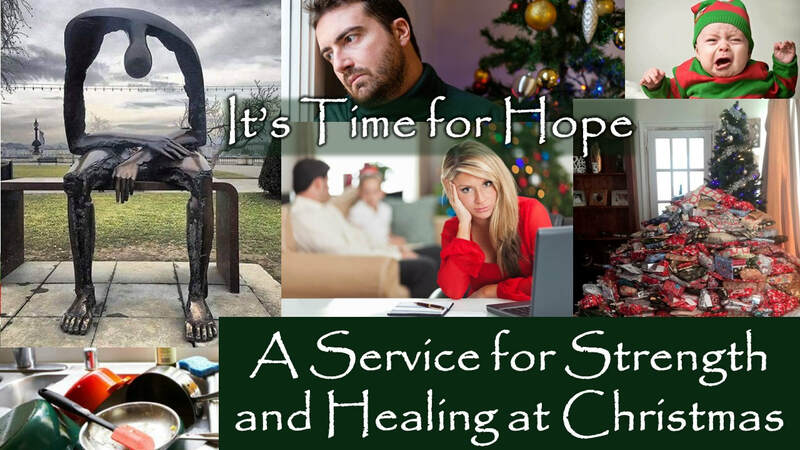 The Service for Strength and Healing at Christmas is an opportunity for us to gather together, center ourselves in God’s presence, and seek encouragement and the Lord’s strength as we approach Christmas Day. The traditional service will focus on the message “It’s Time for Hope” and will feature familiar hymns and prayers filled with God’s promises. The service will conclude with Holy Communion and the opportunity to receive anointing with oil and healing prayers or the option to have a time of silent prayer. A nursery and children’s church will be provided during worship. There will not be Sunday School for children or youth. Adult classes will make their own plans for the morning. December 24: Christmas Eve Candle Light Communion - Contemporary at 4:30 p.m. & Traditional at 6:00 p.m. This year both worship services will feature honorary & memorial poinsettias and the message “It’s Time for Silent Night”. At the 4:30 p.m. Contemporary service, the praise team will lead the singing of Christmas hymns, and there will be a musical performance of “O Holy Night” by Kamryn Murphy and a musical performance of “Winter Snow” by the ensemble of Charley Cuti, Izze Russell, Shellie Milliron, Allison Milliron, and Becky Purvis. At the 6:00 p.m. Traditional service, Christmas hymns will be accompanied by organist, Clytae Fulda, and there will be musical performance of “Welcome to Our World” by Henry Bennett and a musical performance of “O Holy Night” by Katie Smith. 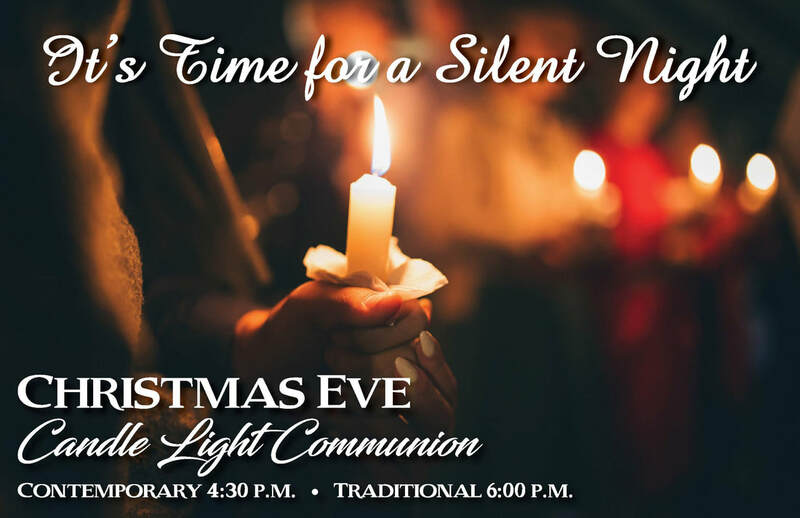 Both services will conclude with Holy Communion and the candle light singing of “Silent Night” accompanied by Alison Blades on cello and Jonah Blades on violin. A nursery is provided. Each year Kensey collects items for Show Hope Special Care Centers in China. The Care Centers care for orphaned children with special needs. Please help her meet her goal this year of collecting 1,000 tubes/jars of diaper rash cream or ointment. Monetary donations will be accepted. Checks should be made out to Show Hope. Please bring your donations to First United Methodist Church. We will collect items through December 26. If you have any questions, please contact Charles or Leslie Cuti. The Youth will have a “Pajama Jam” Worship night on December 2 from 5:00 - 7:00 p.m. and will be collecting pajamas for the boys at the Louisiana Methodist Children’s Home. Also, a mission offering for the Louisiana Methodist Children’s Home will be collected on Christmas Eve. This Advent and Christmas season our church’s Worship Team has new decorations for the sanctuary’s chancel area. The new greenery, trees, lights, and candles compliment the spatial needs and arrangement of our two worship services. Our sanctuary also has a new projection media system for the front and back of the sanctuary and we have our traditional nativity and Chrismon tree. Finally, we will have honorary and memorial poinsettias that can be ordered through December 9. Each of these items will enhance our church’s experience of worship during Advent and Christmas. Please invite others to be a part of the celebration of the season and share this with your family and friends!